We take it for granted that our local media outlets are going to be homers, and that's generally fine. We're fans, and we want to get coverage from our perspective. But no one can complain about Hawk Harrelson after seeing how a Spanish paper airbrushed a crucial player from a photo to make an erroneous point. The top image appeared in Monday's edition of AS, a sports daily based in Madrid. AS has long been known to be in Real Madrid's corner, and the story concerned Real's rivals, Barcelona. On the play in question, there was debate whether Barcelona's opening goal was onside. 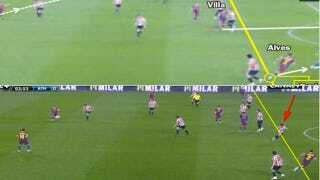 From that top image, it appears Dani Alves was well past the last defender, meaning the score should not have stood. But enterprising Barca fans found their own screengrab, and what do you know: the real last Athletic Bilbao defender, Koikili (red arrow) was "mysteriously" removed from the shot, making the call a lot less egregious. AS apologized today, sort of. "We apologise for the error in the computer graphics in the 1-0 incident," the correction read. If true, if this was somehow a computer error, we should be more concerned about this than about Watson: not only are the machines self-aware, but they're Real Madrid bandwagoners too.